Hamburg 08/07/17 - International cooperation is now more critical than ever, OECD Secretary-General Angel Gurría said following a G20 Leader’s Summit marked both by controversy but also advances on a range of policies to tackle global challenges. 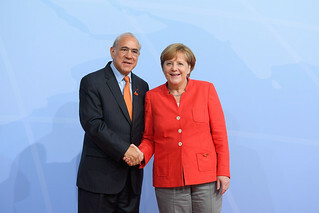 Mr Gurría spoke to the Summit on issues reflecting just a part of the broad range of support on policy design, evidence-gathering, standard setting and monitoring undertaken by the OECD for the German Presidency of the G20, often in association with other international organisations. The OECD contributed to progress achieved in the contentious discussions on climate change and energy. The Organisation’s report Investing in Climate, Investing in Growth shows how integrating measures to tackle climate change into regular economic policy will have a positive impact on growth. Despite the US decision to withdraw from the Paris Agreement, all 19 other G20 countries reaffirmed and stated as irreversible their commitment to fight climate change. “Protecting the environment and fighting climate change can be a source of business, investment, technology and jobs. There is common ground to work together on this crucial endeavour,” Mr Gurría said to the leaders. The importance of ensuring a rules-based global economy that creates a level playing field for all participants was reaffirmed during the Hamburg discussions. The leaders called on the member countries of the Global Forum on Steel Excess Capacity to fulfil their information-sharing and cooperation commitments by August 2017. As facilitator of the Global Forum, the OECD said it will support it in producing a report with concrete policy solutions to tackle overcapacity by early November 2017. This, along with the reaffirmation on commitments with due diligence and responsible business conduct, underpinned a key pillar of the German G20 Presidency. In their final communiqué, the G20 leaders said they would fight protectionism, including all unfair trade practices, and promote a favourable environment for trade and investment. They called on the OECD, WTO, World Bank and IMF to continue their work to better understand trade impacts and report back to the G20 in 2018. They also recognize the need to ensure that trade and investment work for all and deliver inclusive growth. She also welcomed the Summit’s outcomes related to gender, having been a strong promoter of the commitments made by G20 Leaders in Brisbane in 2014 to increase women’s participation in the labour force by 25% by 2025. Since then, the OECD has continued to contribute to, and encouraged implementation of, the range of initiatives agreed by the G20 to help women fulfill their full potential. They include the eSkills4Girls initiative to promote opportunities and equal participation in the digital economy, particularly in developing countries, and the Women Entrepreneurs Financing Initiative established by World Bank with US support. The G20 reaffirmed its commitment to create a globally fair modern international tax system. The OECD’s Secretary General’s report to G20 leaders released just ahead of the Hamburg Summit updated progress in areas such as movement towards automatic exchange of information between tax authorities and implementation of key measures to address tax avoidance by multinationals. Calling for improved governance of migration and comprehensive responses to challenges posed by refugees and forced displacement, the leaders asked the OECD in cooperation with the International Labour Organisation (ILO) , International Organisation for Migration and(IOM) and the UNHCR, to provide annual updates on trends and policy challenges. The G20 leaders also addressed health and how to tackle global challenges such as antimicrobial resistance which undermines the effectiveness of antibiotics. Working with the World Health Organisation (WHO), the Food and Agriculture Organisation (FAO) and World Organisation for Animal Health (OIE), the OECD drew up a report on ways to boost antimicrobial research and development, while ensuring better usage and affordability of antibiotics. Further information on the OECD’s work for the G20 is available at the www.oecd.org/g20; from Nicolas Pinaud or from the OECD’s Media Office (tel +33145249700).